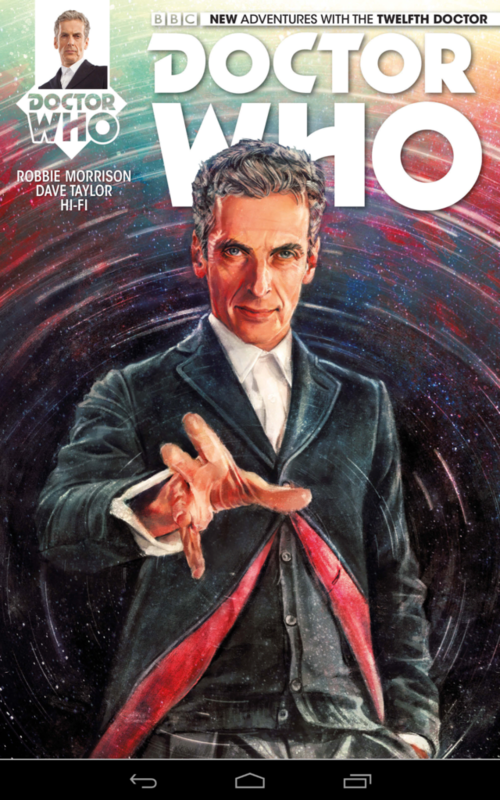 Doctor Who: The 12th Doctor #1 Comic Book Review! I’ve been surprised with how much I’ve enjoyed Peter Capaldi’s 12th doctor. This happens with every new incarnation of the Doctor in my lifetime (“he’s wearing tennis shoes and a suit!” and “he looks like a baby with a chin!”), but Capaldi’s announcement seemed to receive extra passionate disapproval. After much speculation about finally changing the Doctor’s gender or race, with such names as Hermoine Granger and Stringer Bell thrown into the ring, at the end of the day the announcement was “Please welcome another old white guy!” Oh. Even stranger, Capaldi has previously appeared on Doctor Who as Caius the Roman aristocrat that Matt Smith saves during the episode “Pompei.” It’s not a particularly memorable performance by Capaldi, although to be fair the character isn’t written to be much more than a stock wealthy dad. Either way, my expectations for the eight season of the New Who, and the twelfth doctor, were pretty low although I was willing to give him a chance. Who could resist that creased, stern face? Having watched every episode to date, I can affirm that Capaldi has been nothing but impressive as an older, crankier, more wounded Doctor. The relationship with Clara Oswald has shifted from “will they won’t they” to “you look fine, I guess.” The dynamic is far more contentious, with Oswald and the Doctor sparring like an old married couple minus the occasional snuggle. Most importantly, the writing and plots of the eighth season have been incredibly strong, with substantially less filler than your typical season, and a compelling mystery involving the gates of heaven. One problem I’ve had with the eighth season, though, is that typically I binge watch entire seasons of Doctor Who at my own leisure after they’ve been completed. This whole “waiting for new episodes” approach is leaving a Gallifrey-sized hole in my time-travel needs. I’m typically wary of stories that peripherally tie into the core medium I love (I think it stems from years of Comic book movie video games, yes I’m looking at you Wolverine). Still, this first comic book issue including Capaldi’s Doctor really hit the spot, with writer Robbie Williams really capturing the essence of both the new Doctor and his relationship with Clara. Preach that confidence new Doctor! The story involves the Doctor and Clara travelling to a previously frost-covered planet to help teach Clara how to ski (for a class field trip naturally). The Doctor insinuating that the students are calling Clara “Oddball” as a child-like dig at her name is a perfect example of the new relationship, with the Doctor caustically waving barbs at Clara just to see her react. Once on the planet, the Doctor and Clara find that its ecosystem has changed entirely, warming and featuring monkey / skunk hybrids that Clara appropriately deems “skunkeys.” A little exploration quickly reveals a scientific faction terraforming the planet, but as we all know from Doctor Who 101, there’s always something at the center of the planet waiting to escape if you dig deep enough. 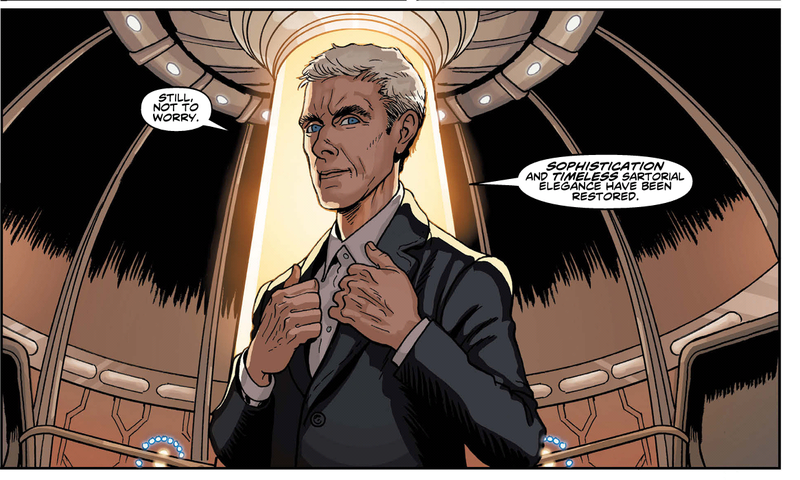 All in all, Doctor Who: The 12th Doctor #1 is a fun read, and honestly feels like some much desired bonus footage of the eighth season. There’s always the implication that there are so many more adventures we never see, and this comic does a nice job of elucidating one of those.